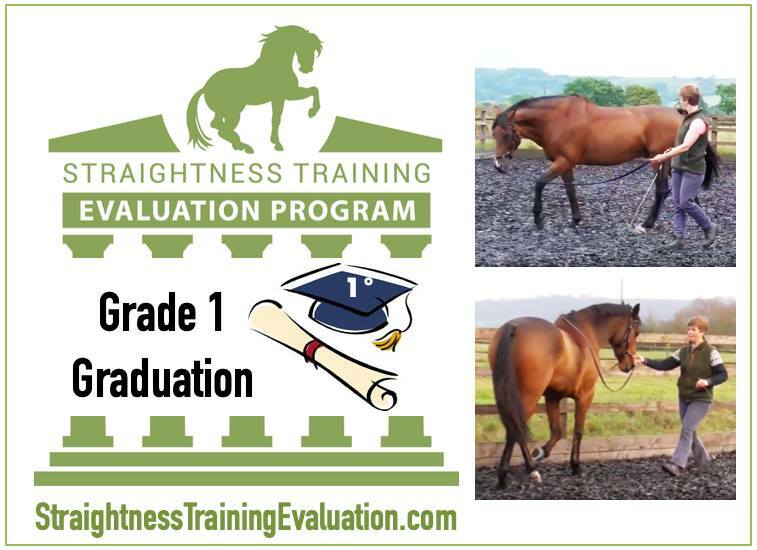 ST Mastery student Jo Vincent from the UK passed Liberty 1 with her gelding Mr Wonkus and with that Touchstone, she passed all 5 Touchstones in Grade 1 in the ST Evaluation Program! “Hi my name is Jo Vincent and my partner is Mr Wonkus – a 13-year-old cob x thoroughbred gelding. We have had Wonk from a 4-year-old, he is my daughter’s horse and she evented him up to BE Novice level. He has a tremendous brain and willingness to please. When my daughter went off to Uni she left him with me and by this time he was having issues with arthritis In his hocks and front near fore. He had steroid injections which resulted in laminitis and I was desperate to find some way of helping him so that in the future we would not need the injections. Mini Mastery appeared out of the ethos and I then signed up-to Mastery in November 2015. I have been very fortunate to have Roz Richmond not 12 miles away from me and she has been an absolute godsend, as I really am not your natural horseman and there were many times that I thought I was totally incapable of grasping the concepts. So I submitted my first touchstone in March 2016, GW1, and passed, then continued on with 3 other touchstones, which I passed until I got to the Riding. This touchstone really made me understand more about what ST is all about I had to dig deep and learn to grasp the comments sent back and unravel them and get to the core. I passed my Riding on the 3rd attempt and I realize I have a long way to go but am happy to go there as it is amazing when I get it right, to feel the strength he has from his back through to the front and the lift. The difference it has made to Wonk? He is soo much stronger and he now offers a medium trot rather than it having to be manufactured. My daughter comes home and rides and competes him and cannot believe how much lighter he is In the hand and the power he generates from behind. I thank you, Marijke, for your programme and for how you are always pushing the goal posts further away and for your ST community where we can all share and progress together. I feel now that I am developing an eye and feel and understanding whilst working with Wonk and appreciating his smallest effort and recognizing when he is letting me know that less is more.